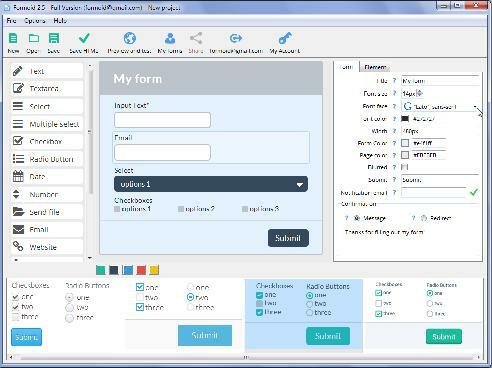 Formoid is a free desktop app that helps you easily create contact us form, html5 forms, html5 form validation, contact form and more in a few seconds without writing a single line of code. Create innovative online forms in just a few clicks. Hello. Formoid 2.3 Full Version, Mac OSX 10.8. I tried to activate my Formoid software but it's saying "email already registered". I just bought formoid through paypal. I can install with no problem. The program crashes just when i try to launch it ! Hi, Formoid! What will the hosting for unlimited forms cost after the first year? Thanks. I just bought your software and I cannot find how to register the application. I tried to register it but it is giving me error: Invalid key. What am I doing wrong? Hello. I would like to incorporate formoid into my site. Hi, I got your email about your form and it looks awesome, however there are a few things. 1.